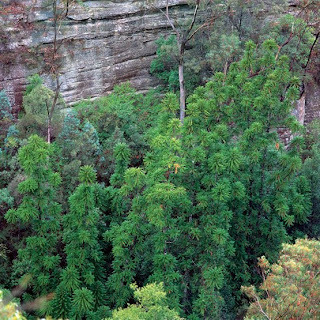 Wollemia nobilis is a coniferous tree discovered 150 km north from Sydney, in 1994 by David Noble. The discovery is considered, by some, to be one of the most important botanical finds of the century. When this plant was discovered, there were 40 trees in the world, with a worrying lack of genetic variation. The area, where the species were located, is undisclosed to the public due to posible viruses introduction. Nowadays due to a propagation programme, is present worldwide, and a well considered ornamental tree.